Special Containment Procedures: SCP-3536 is contained in a Safe-class storage room in Site-234. Testing of SCP-3536 with other bacterial SCP objects requires written permission from the acting Research Supervisor (currently Dr. Maravilla). All SCP-3536-1 instances created for testing purposes are to be destroyed by incineration following conclusion of testing. Description: SCP-3536 is a large piece of machinery approximately 30 m2 in area. 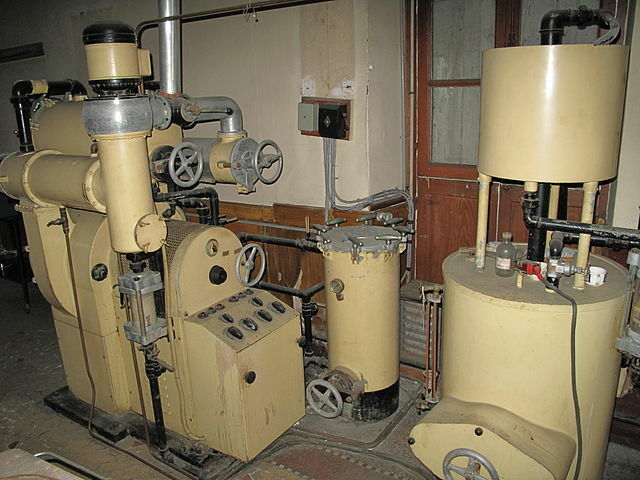 SCP-3536's main components include a hopper labeled 'Raw Materials', two broth tanks, several pumps and compressors, and a console containing several dials. Both tanks will spontaneously refill with nutrient broth if emptied completely. Due to corrosion, only one dial is movable. SCP-3536 also possesses a receptacle that attaches to a small glass vial. A handwritten instruction manual recovered alongside SCP-3536 has provided incomplete details to its operation. The manual states that any mixture of compounds containing carbon, hydrogen, nitrogen, oxygen, and phosphorus will fuel SCP-3536, and recommends a mixture of charcoal, phosphoric acid, sulfuric acid, and nitrogen gas. If a bacteria-containing sample is placed in the vial and inserted, SCP-3536 will proceed to use the stored raw materials to create live replicas of any bacteria present in the sample. These replicas, hereafter designated SCP-3536-1, are magnified in size according to the selected setting on the movable dial; testing has resulted in instances ranging in size from 2 to 45 cm. SCP-3536-1 instances are structurally stable, despite the predictions of the Square-Cube principle. Otherwise, they are not visibly or structurally different from their nonanomalous counterparts. Discovery: Law enforcement in Georgetown, Guyana detained nine individuals attempting to kidnap a patient from Davis Memorial Hospital afflicted with endocarditis. The group was responsible for multiple reports of battery and illegal entry into various hospitals, and had gained notoriety for their modus operandi of collecting various samples from infectious and terminal patients. Upon investigation of the ringleader's residence, SCP-3536 was discovered in the basement. A large amount of discarded SCP-3536-1 membranes were found, consistent with the later hypothesis that the individuals had subsisted on a diet consisting solely of SCP-3536-1. Also found alongside SCP-3536 were several dozen scrapbooks containing handwritten recipes involving SCP-3536-1 instances, personal thoughts, and plans consistent with the failed kidnapping. Excerpts from the books indicated a growing obsession with SCP-3536 and SCP-3536-1 among the group. Of note, analysis has shown that the handwriting of the instruction manual does not match that of any of the nine members of the group. D-class test subjects who have consumed SCP-3536-1 instances generally (~90%) report a very pleasant taste, but testing has failed to prove any inherent addictive or mind-affecting properties in SCP-3536 or SCP-3536-1.